Personalized Personal Security Alarms -Safety Sirens Keychains. Promotional, Inexpensive. Budget Prices in America. 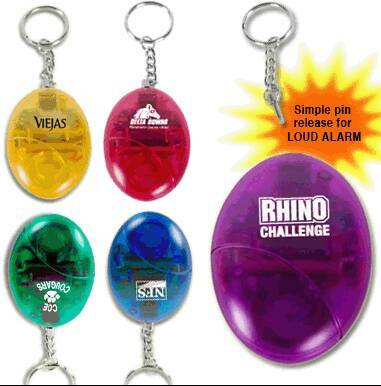 We supply bulk safety- security alarms key chains, personalized with your custom imprint, at bargain prices. Free artwork design. We also supply blank (not custom imprinted) bulk personal alarms: see the PriceTable below. Budget Prices in USA and Canada for wholesale personal safety alarm key chains. American clients don't pay taxes. Prices below include your 1-color custom imprint, or they are for blank (not custom imprinted) personal safety alarm key chains. Imprint Setup Charge $60.00 per color. 10 days after art approval; contact us for faster delivery. Blank (not custom imprinted) personal alarms ship next day from order. Personal safety alarm with quick pin release to activate intense siren: it reaches up to 130 decibel. Oval designed alarm provides your needed security wherever you go. Key ring & battery included. Colors available: Translucent yellow, green, hot pink, purple, blue. Product size: 2-3/8" x 1-5/8". Production Time: 10 days after art approval; contact us for faster delivery. Blank (not custom imprinted) personal alarms ship next day from order.